With webKORIGEN, target irradiations can be simulated in neutron spectra corresponding to PWR, BWR and Fast Reactors or a dedicated facility with thermal neutrons. In the neutron activation mode, sub-critical systems can also be investigated. Fertile materials (U238, Th232, etc.) can be irradiated in the reactor systems listed above to investigate, for example, the approach to criticality. Medical isotope production in nuclear facilities can be investigated quantitatively. 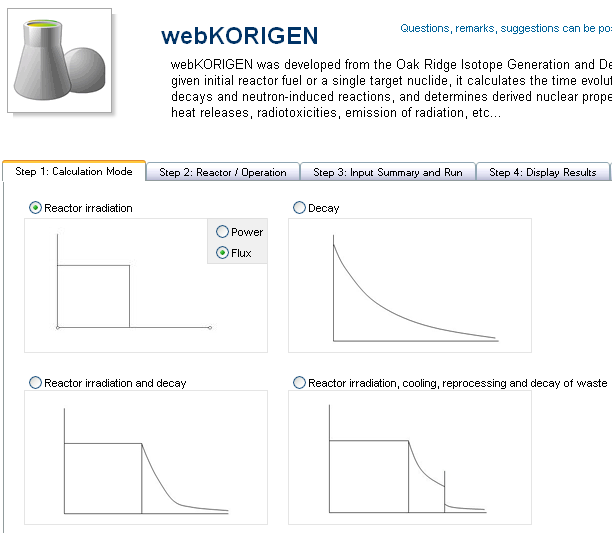 In addition to reactor irradiation simulations (for PWR, BWR, and fast reactors) with decay storage and reprocessing, webKORIGEN can also be used for neutron activation studies and sub-critical system analyses. 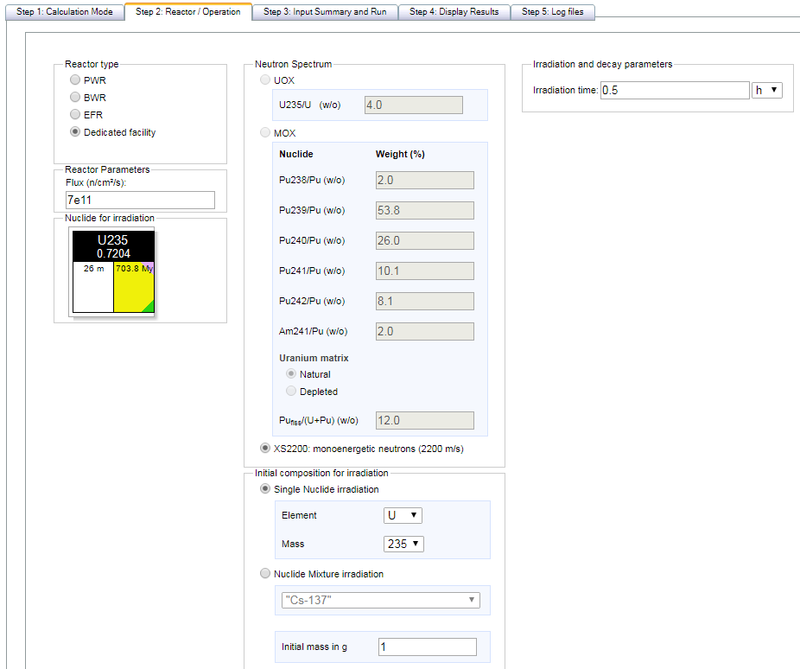 Neutron activation can be investigated by choosing mode 1 (reactor irradiation) in the webKORIGEN user interface as shown in the figure and selecting the constant flux mode. This mode of operation allows for target irradiations in the neutron spectra corresponding to PWR, BWR and Fast Reactors or a dedicated facility with thermal neutrons. 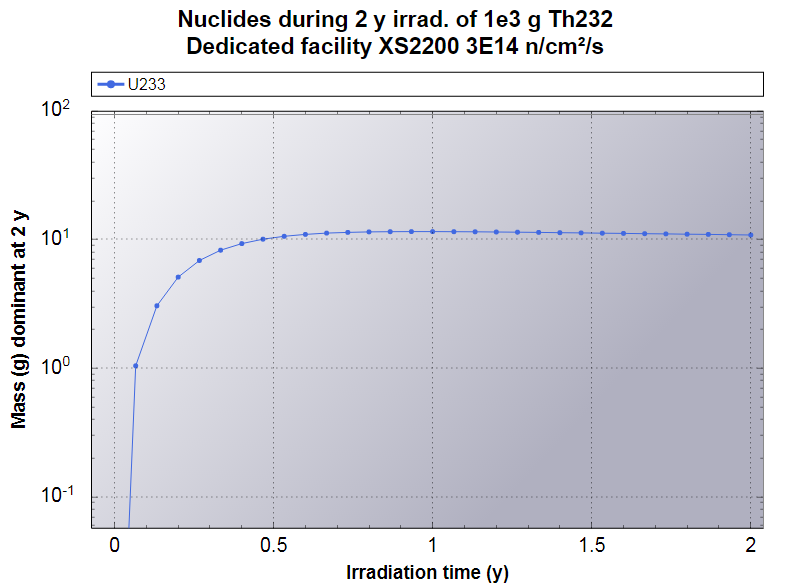 Target irradiations are restricted to small samples of a single-nuclide material in the irradiation facility. In this way the neutron spectrum in the reactor is not disturbed by the presence of the irradiation target. It is of interest to calculate the fission yield of Ba139 from the irradiation of 1 mg U235 (from enriched uranium) in a thermal neutron spectrum. The thermal neutron flux is 7x1011cm-2s-1. In Step 1, select Mode 1 (reactor irradiation) with constant flux is chosen. In Step 2 (see diagram below - click on diagram to enlarge), the reactor type and neutron flux are set – Dedicated facility and 7x1011cm-2s-1 respectively. In the central panel, the nuclide and its mass are set – U235 and 1 g respectively. In the third panel, the irradiation time is set to 0.5 h.
In Step 3, the full input is summarised and the calculation can be started. In step 4, from the central panel in the output grid (shown below), the element Ba is checked. 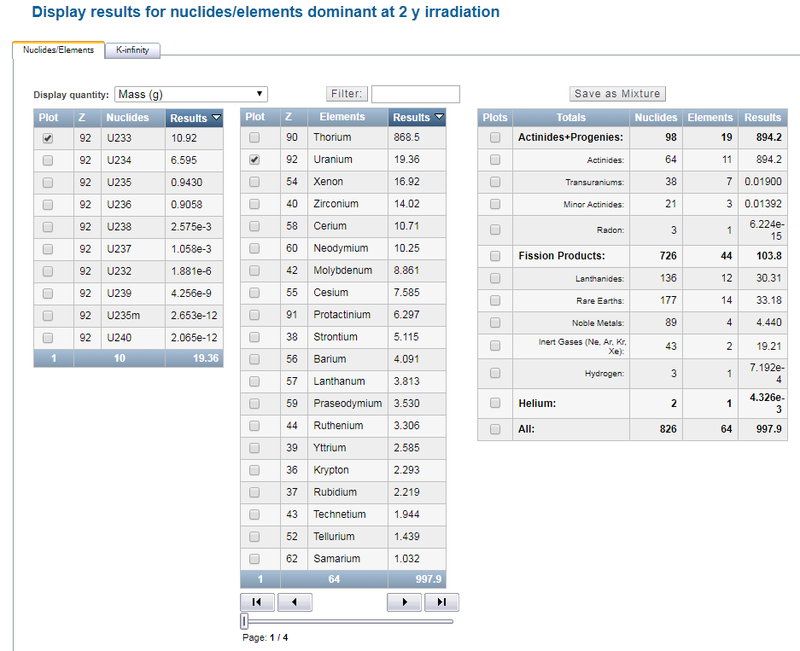 The user should then click on the Filter button to see a list of all barium isotopes and their masses in the leftmost panel. By clicking on the Plot Nuclides button at the bottom of the page, the results showing the formation of Ba139 are seen (also shown in figure). The neutron activation mode can also be used to investigate various aspects of sub-critical systems. In contrast to critical reactors, sub-critical systems need an extra source of neutrons in order to sustain a chain reaction. A reactor containing thorium (Th232) cannot sustain a chain reaction. A certain amount of fissile plutonium, for example, is required to make the system critical. An alternative approach is to irradiate the thorium in a thermal reactor. In this case the fissile U233 is produced (through neutron capture of Th232 to produce Th233 and then radioactive decay to U233). If enough U233 is produced, the system can become critical. This process can be simulated with webKORIGEN. In Step 1, Mode 1 (Flux) with constant flux is chosen. In Step 2 (see diagram above), the reactor type and neutron flux are set – Dedicated facility and 3x1014cm-2s-1 respectively. In the central panel, the nuclide and its mass are set – Th232 and 1 kg respectively. 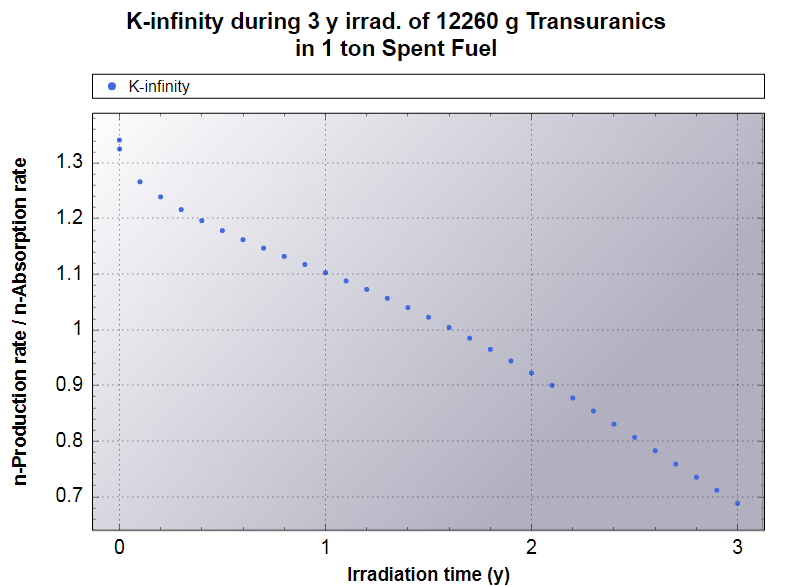 In the third panel, the irradiation time is set to 2 y. In step 4, from the central panel in the output grid (shown), the element U is checked. 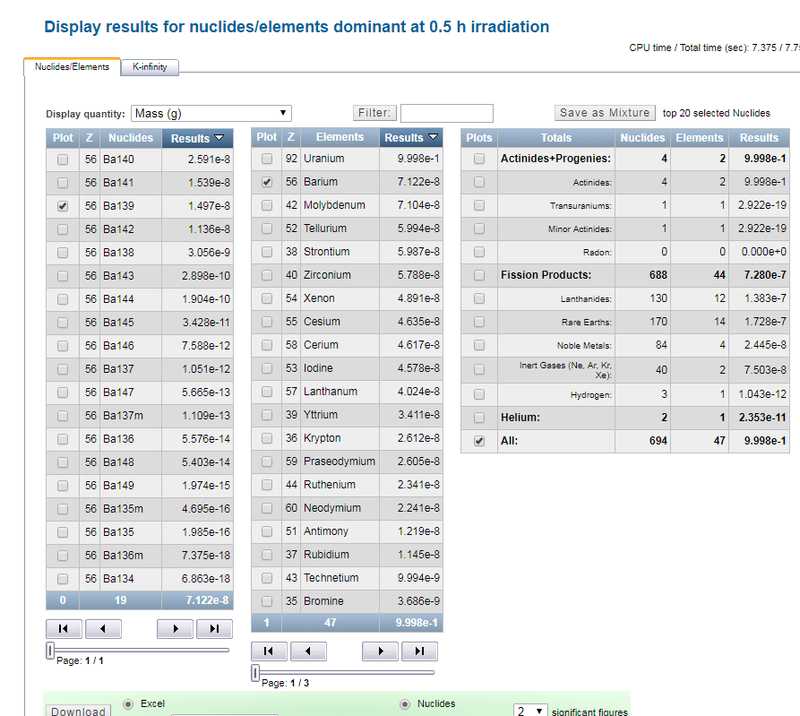 The user should then click on the Filter button to see a list of all uranium isotopes and their masses in the leftmost panel. 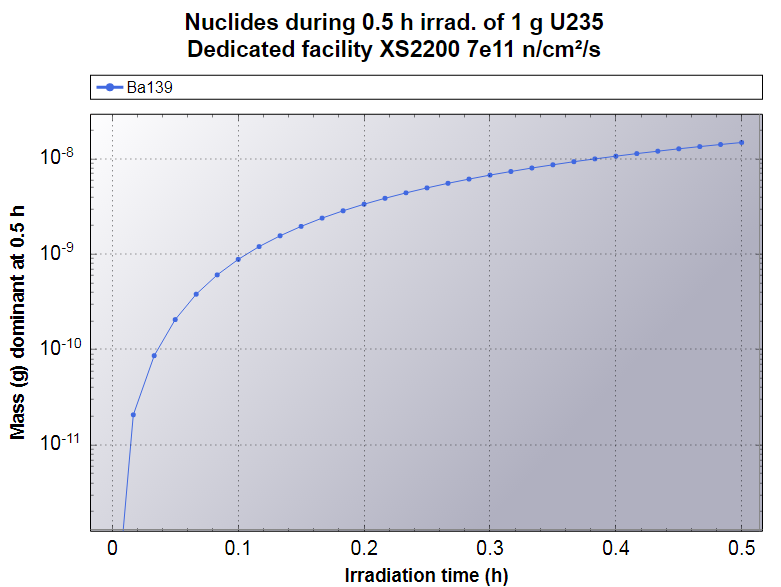 By selecting U233, and clicking on Plot Nuclides a plot of the amount of how the U233 increases with time can be obtained. 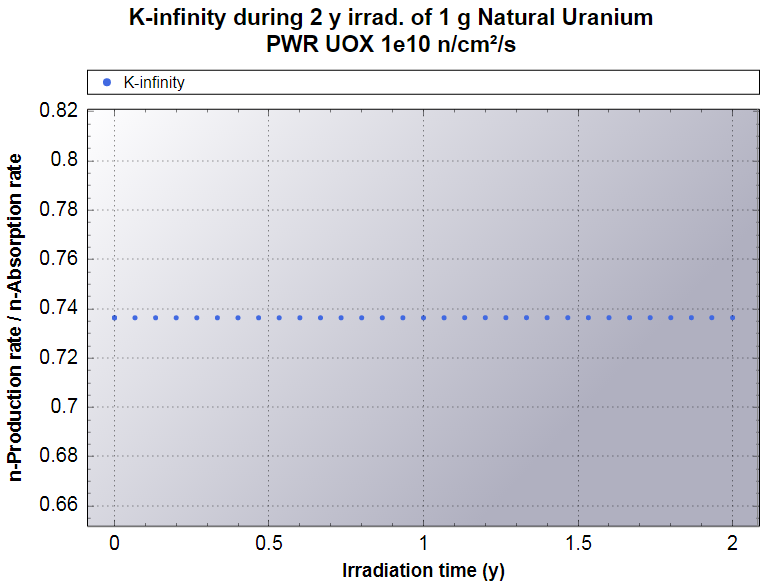 It is also of interest to plot the kinfinity value which shows the ratio of total neutron production to absorption rates. Low values of kinfinity indicated that neutrons are mainly absorbed by the system. At kinfinity close to unity, the neutron production and absorption are almost equal – this is a system near to criticality. 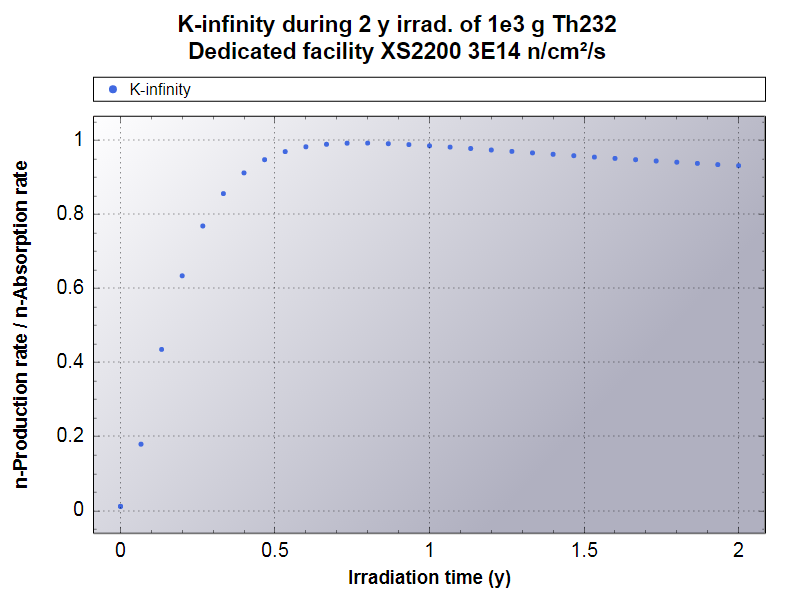 In the example above, it takes more than 2 years irradiation of Th232 in a thermal reactor to produce enough fissile U233 to sustain a chain reaction. As described in the previous section, the neutron activation mode in webKORIGEN can be used to obtain information on the neutron multiplication characteristics of material irradiated in the neutron spectrum. Of particular interest is the value and variation of kinfinity for example for a pre-defined mixture such as a mixture containing radioactive waste components. It is also important to note that kinfinity depends on the neutron cross sections. These cross sections depend in turn on which type of neutron spectrum is being used i.e. PWR, BWR, EFR or dedicated. This is further explained in the following section. In this example, it is assumed that the nuclide mixture has been created previously using the Nuclide Mixture module. If this is not the case then the nuclide mixture should be created first. In Step 2: Reactor / Operation. By default the PWR is selected - this defines a neutron spectrum. The default flux is 3x1014cm-2s-1. Since we are interested only in the kinfinity of a mixture, the neutron flux should be set to some smaller value (e.g 1e10 since the module currently cannot accept 0). On the same page in the central panel at the bottom, you can select a mixture (from the list previously created). In this case select natural thorium. The default irradiation time of 1 year is not important in this case. In Step 4 Display results, click on the central tab and then on Plot kinfinity. There you will see that the kinfinity value is approximately 0.7. In this example we consider the use of a PWR to transmute its own nuclear waste. In Step 1: webKORIGEN is used to calculate the mass of transuranics generated in 1 ton spent fuel PWR over a five year irradiation period. The fresh fuel has an initial enrichment of 4.2%. The burnup is 50 GWd/t. We consider the spent fuel following 6 years cooling. Total mass of transuranics generated is 12.26 kg per ton spent fuel. In Step 2: create a nuclide mixture consisting of the 12.26 kg transuranics. In Step 3: investigate how this nuclear waste can be transmuted in a PWR neutron spectrum. This is done by using webKORIGEN in Mode 1 (flux) as described above. The neutron spectrum PWR with a flux of 3x1014cm-2s-1 is selected. The nuclide mixture created previously is selected for irradiation. The results are shown in the figure. This page was last modified on 18 March 2019, at 09:06.